"We are terribly saddened to learn about the untimely passing of such a passionate leader, philanthropist and humanitarian, Lewis Katz. He meant a great deal to us all and served as an inspiration with his ongoing efforts to give back and improve his community, about which he cared so deeply. On behalf of the Philadelphia 76ers, we send our sincere condolences to the entire Katz family during this difficult time." The accolades just keep piling up for Michael Carter-Williams. Thursday, the 76ers point guard was named to the NBA’s All-Rookie Team. Earlier this month, Carter-Williams was named NBA Rookie of the Year following a successful debut pro campaign, during which he led all first-year players in points, rebounds, assists and steals. Carter-Williams was a unanimous selection for the All-Rookie Team, receiving 125 first-team votes. Orlando’s Victor Oladipo picked up 124 of 125 first-team votes. Joining them on the First Team were Utah’s Trey Burke, Brooklyn’s Mason Plumlee and New York’s Tim Hardaway. The Sixers’ Hollis Thompson also received votes, but made neither the First or Second Teams. Tonight, at Disney/ABC’s Times Square Studios in New York City, the 76ers will discover their draft-night fate. They'll know the draft slot for their pick and New Orleans', and whether the Pelicans retain their selection or owe it to the Sixers as compensation for a trade last summer. The Sixers hold potentially two lottery selections: theirs and New Orleans’. The Pelicans’ pick is top-five protected, so if they “win the lottery” and land in one of the top-three picks, they would retain it. The Sixers would be owed a top-five protected, first-round selection for the 2015 draft as future compensation. The Sixers’ draft-lottery representative will be Julius Erving. Last year, it was majority owner Joshua Harris. As the Sixers’ good luck charm, Dr. J will bring with him shards of glass from a backboard broken by Darryl Dawkins during a Dec. 5, 1979 game against San Antonio. Cherry Hill native Jake Spencer, the holder of the glass bits, had his entry selected during a team contest in conjunction with 97.5 FM The Fanatic. Only four times has the team with the league’s second-worst record won the lottery. The last occurrence was in 2009, with the Los Angeles Clippers. The Sixers finished with the league’s next-to-last mark, at 19-63. Only once have the Sixers won the lottery. That was in 1996, when they moved from No. 2 to No. 1 and selected Allen Iverson. The player said it. His coach reiterated it. Michael Carter-Williams, in the same breath, thanked media members who voted him the NBA’s Rookie of the Year and then followed it up by saying he’s unsatisfied with winning a personal award. The 76ers’ point guard spoke Monday about pining for more, not only individual greatness but aspirations of helping the Sixers reach the postseason. That plan took a detour Tuesday, when the Sixers announced that Carter-Williams had undergone successful surgery to repair a labrum injury on his right shoulder. The team said there’s no timetable for the return of the 22-year-old. What does the surgery mean for Carter-Williams? For starters, it’s unlikely he will be available to participate in either of the summer leagues. (The Sixers are expected to field teams for the Orlando and Las Vegas leagues.) There’s no hard-and-fast recovery time for a labrum surgery recipient, but it generally requires two to four months. That timeline would put Carter-Williams in line to be ready for the opening of training camp. Beyond the summer leagues, Carter-Williams can forget about fine-tuning his game. Monday, at MCW’s Rookie of the Year press conference, Sixers coach Brett Brown spoke at length about the summer months being the time when players make their most money, when they can watch gametape and focus on improving one or two skills that had been weaknesses in the past season. For Carter-Williams, those well-documented weaknesses were his shooting percentage and his defense. Rehab on his surgically repaired shoulder will prevent Carter-Williams from hoisting the thousands of shots he was likely to take this summer. In addition, Brown’s desire to have Carter-Williams work on his on-the-ball defense and keeping players in front of him will have to be put on the back-burner as he turns his attention toward injury rehab. The immediate ramifications of Carter-Williams’ surgery won’t be felt in the next few months. Instead, the will bear out when the Sixers’ season begins. Michael Carter-Williams underwent successful surgery to repair the labrum of his right shoulder, the 76ers announced Tuesday, and there is no timetable for his return. The surgery was performed by Dr. David Altchek, of the Hospital for Special Surgery in New York, the team said, and his rehab will be monitored by the team’s head physician, Dr. Brian Sennett of Penn Medicine. The timing of the surgery would seem to put Carter-Williams’ availability for the Sixers’ summer-league teams in jeopardy. The soonest Carter-Williams, who on Monday was named NBA Rookie of the Year, would have to be medically available is in October for the team’s training camp. He sat out from Nov. 13-18, missing four games with a left foot bruise. He did not play between Dec. 6-16, skipping seven games due to a skin infection on his right knee that required a brief hospitalization. And he missed a game Feb. 1 at Detroit with a sore right shoulder. The Sixers went 1-11 in games in which Carter-Williams was a DNP. The offseason was on the doorstep when Michael Carter-Williams, while seated at his Wells Fargo Center locker, was questioned about postseason award voting. Namely, the 76ers’ point guard was asked whether he remembered a tweet from opening night, when Magic Johnson needed nothing more than Carter-Williams’ near quadruple-double to declare him the league’s Rookie of the Year. Johnson certainly took notice. So did media members around the country. 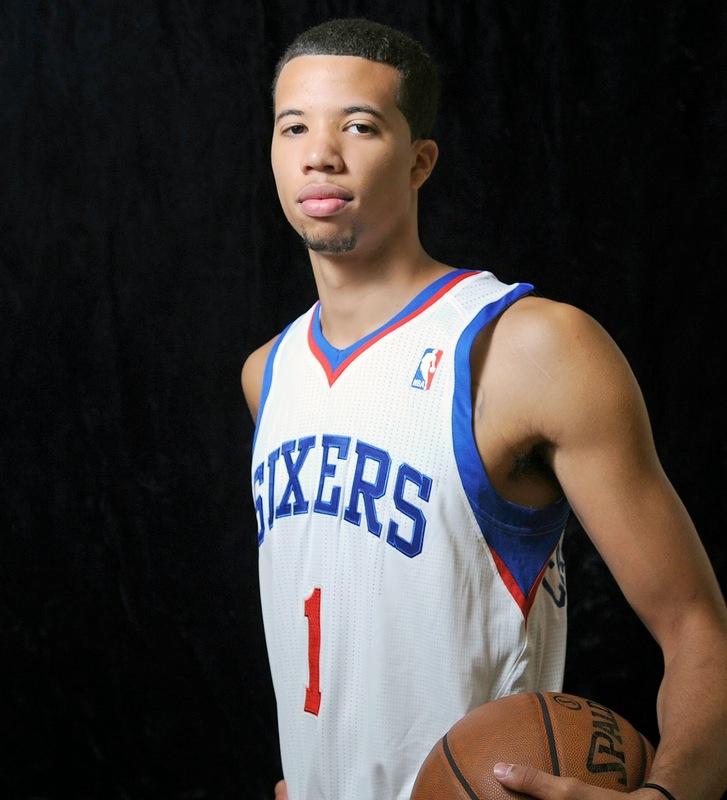 Monday, Carter-Williams was named NBA Rookie of the Year. He became only the second player in franchise history to win the honor, joining Allen Iverson, who took home the hardware in 1996. A 6-6 guard out of Syracuse, Carter-Williams led all rookies in scoring, assists, rebounds and steals and was often a bright spot in a bleak season. It was believed the Sixers’ 19-win campaign, amid the franchise’s rebuilding effort, would hinder Carter-Williams’ case to win the award. Instead, he edged out Orlando’s Victor Oladipo, 569 points to 364, to win the award and garnered 104 of a possible 124 first-place votes. Trey Burke of Utah finished third in the voting. Including Carter-Williams, the last 11 Rookie of the Year winners have come from teams with losing records. The 11th overall pick in last summer’s draft, Carter-Williams is the lowest-picked Rookie of the Year recipient since 1987-88, when the New York Knicks’ Mark Jackson – who went 18th overall in the previous year’s draft – took home the hardware. Carter-Williams began turning heads in the first game of his first pro season. He posted 22 points, 12 assists, nine steals and seven rebounds Oct. 30, as the Sixers took down the defending champion Miami Heat, 114-110. Afterward, Johnson took to social media to gush about Carter-Williams’ performance. “I just got done watching the guy I think will be the Rookie of the Year, Michael Carter-Williams of the 76ers,” the NBA legend tweeted. Seven months later, Johnson’s prediction panned out. Statistical support was on Carter-Williams’ side. He joined Oscar Robertson (1960-61) and Alvan Adams (1975-76) as the only players to pace all rookies in scoring, rebounds and assists. On that note, these per-game averages by Carter-Williams led all first-year players: 16.7 points, 6.3 assists, 6.2 rebounds, 1.86 steals and 34.5 minutes. What’s more, his 4.8 defensive rebounds per game were the most ever by a rookie guard, eclipsing the 4.4 defensive boards by Chester native Tyreke Evans during his 2009-10 Rookie of the Year campaign with Sacramento. 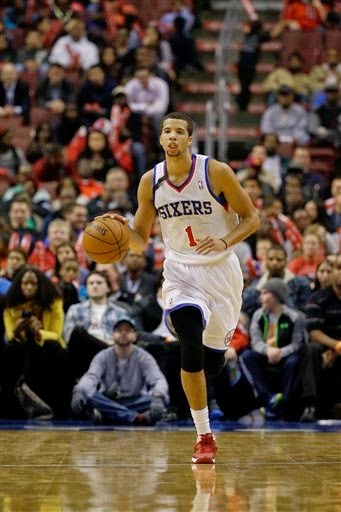 Carter-Williams was named Eastern Conference Rookie of the Month in four of the six months of the regular season. There’s a decent chance the Sixers could become the first team since the Buffalo Braves (Bob McAdoo in 1972-73, and Ernie DiGregorio in 1973-74) to boast back-to-back Rookies of the Year. Center Nerlens Noel, who missed all of last season while rehabbing a knee injury, is eligible, as will be the slew of players the Sixers take in June’s draft. They hold seven picks, including two in the first round.